Pishiobury Friends. : Work Party Thursday 19th March. Work Party Thursday 19th March. Some time ago a Victorian kissing gate was removed from the footpath, during path improvements, where it crosses Pishiobury Drive. Because this gate was of historical significance, once being part of the long run of estate fencing which went from the main road right down the Park to the Ha-Ha wall near to the House, then it was thought worthwhile of preservation. 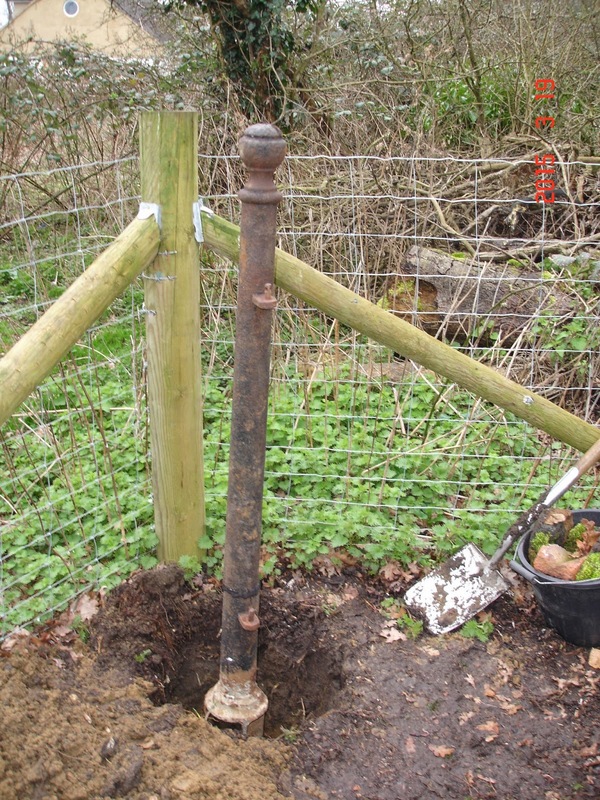 The ironwork was in a derelict condition and unfortunately the cast-iron post was broken when it was removed without care from the ground where it had been for over 100 years. We have done our best to resurrect and renovate the kissing gate in the Activity Area. Because it is not in a safe condition it has been immobilised so that it can been seen but not used. We shall need another session to hang the gate because we are not yet confident that the post is strong enough to hold it. Work Party February 19th 2015. Work Party January 15th 2015. Work Party December 18th 2014.